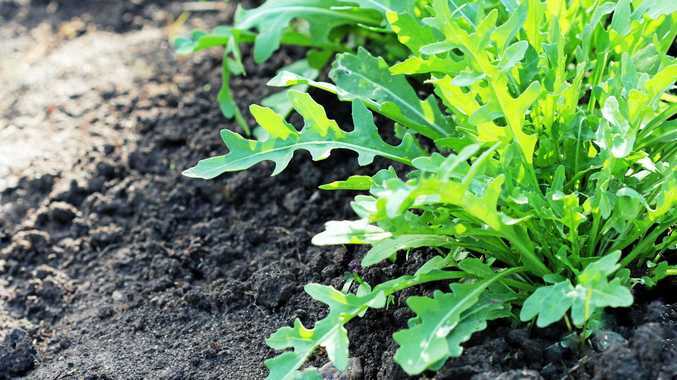 Rocket (eruca sativa), sometimes called arugula, makes a vibrant and peppery addition to salads, pasta, pizza and pesto. Rocket leaves also contain vitamins and minerals, are low in calories and carbohydrates and, being in the same plant family as broccoli, kale and cauliflower, provide a valuable source of antioxidants. It's easy to grow your own rocket at home, so you can regularly add healthy handfuls of leaves to lots of different dishes. Here's how to start a pot or patch. In a sunny or partly shaded spot in the garden, enrich the soil by mixing in some blood and bone. If you're growing rocket in a pot, choose a pot with good drainage holes and fill with a quality potting mix. Sow seeds direct where they are to grow and rake lightly into the soil or potting mix, so the seeds are about 3mm deep. Keep the soil or potting mix moist and seedlings will emerge in 10-14 days. Apply a fertiliser solution around the root zone. Start harvesting tender young leaves 7-8 weeks after sowing. Regularly picking leaves will help encourage fresh new tangy foliage.